Tuesday night the Pub Night neighbors and friends headed over to the Green Dragon for Meet the Brewer. It was an exciting time, because the brewer to be met was our friend Corey who brews at McMenamins' Cornelius Pass Roadhouse. Even the wives showed up -- except Amy, stuck out in the bayou -- so you know it was a big night. The Green Dragon has done a smashing job with the Meet the Brewer series, and I'm especially grateful that they chose Tuesday for it, since that's my habitual night out. I'll be honest, I'm not so gregarious that I need to meet a brewer every week. What attracts me is that the gig includes three kegs of whatever they want to show off. We almost had to settle for two choices last Tuesday: McMenamins' uses a non-standard keg that requires special fittings, and one of them delivered to the Green Dragon didn't work. Luckily, Corey lives nearby and was able to grab a spare from his place, so we got to try all three: Rose City Til I DiePA -- the lovely double IPA that took second place at this year's Battle of the Belt -- as well as Testament Double Red Ale and Evolution Amber Ale. Evolution is very sessionable, as they say nowadays -- you could enjoy a few of these and not damage yourself too badly. It's not too strong, about 4.7%, flavorful, cloudy and rich, a little bit sweet. Corey originally called it an Alt, but I think the Amber Ale is a good description. I may be a little confused about Alts, because every time I try one I think, "I'm not sure that's an Alt". My dim recollection from a trip to Germany several years ago was of a dark beer, light in body and alcohol, with almost no hop or yeast flavor. Evolution is different from most of that, although it's true that it's light in alcohol and not overly hoppy. The Testament Double Red is something that I've tasted from a growler before, and even though it was a couple days in the fridge at that point, it reminded me of Ninkasi's Believer. Come to find out, Corey reveals that Believer was indeed the inspiration for Testament -- I apologize if this sentence causes Google to bring the whole Sunday School class to a beer blog -- and Testament lives up to its forebear. It was full-bodied and all flavor, flowery with just enough bitterness. Tuesday night's keg was dry-hopped then aged for three months. 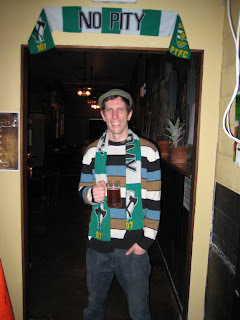 As a member of the Timbers Army -- the most rabid fans of the Portland Timbers soccer team -- Corey had to name his 9.5% Double IPA "Rose City 'Til I DiePA", after one of the Army's chants. Sad to say, I've never been to a game, but I'll gladly drink the signature beverage. It's along the lines of classic northwest big IPAs. As I was sipping one Tuesday night, I fancied that I could pick out the various tastes of it one at a time -- now the malt, then the hops, then the alcohol -- like picking out the separate notes of a musical chord. Delicious. For a sedentary person like me, who feels a sense of defeat on any day when I find myself driving or riding in a car, the Cornelius Pass Roadhouse is not going to be on my regular circuit. We get an occasional taste of Corey's beers at the Broadway McMenamins', though some of them -- like RCTIDPA -- are only served at CPR. So, another tip of the hat to Green Dragon for bringing in some brews that are otherwise out of my reach. Wow, I didn't realize Alaskan Amber was an Alt. At some point I'm going to snag some of the German Alts and recalibrate. Anyway, I don't get terribly hung up on style, all I know is Evolution tastes great.